Hot Tub Suppliers, based in Leicester, Leicestershire, is celebrating after collecting Gold and Bronze Awards at the prestigious British Pool & Hot Tub Awards, hosted by BISHTA and SPATA. Hot Tub Suppliers, based in Leicester, Leicestershire, is celebrating after collecting Gold and Bronze Awards at the prestigious British Pool & Hot Tub Awards, hosted by BISHTA and SPATA held on Sunday 31st January at the Ricoh Arena, in Coventry. The British and Irish Spa and Hot Tub Association (BISHTA) and the Swimming Pool and Allied Trades Association (SPATA) are the relevant trade associations upholding standards within the Wet Leisure Industry. Rebranded in 2015 the first SPATA awards were won in 1978 and the first BISHTA awards were won in 2008, these well-established awards, are the UK’s number one wet leisure industry accolades. The BISHTA awards were given to Hot Tub Suppliers for Hot Tubs Change Lives (Gold Award), Best Website (Bronze Award) sponsored by Spatime by Bayrol, Complete Pool Controls, Elite Spas and Spa Crest Europe. The Gold award was won by Hot Tub Suppliers in a very special category that celebrates the life changing benefits that hot tubs and spas provide consumers. The award provides the opportunity to really focus on the health benefits of hot tub and spa ownership and how they can make an enormous impact on people’s lives. 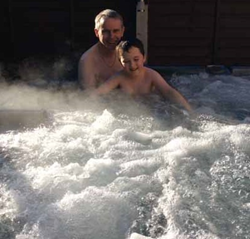 The Gold award was won, by Hot Tub Suppliers for a hot tub they installed for the family of a brave 8 year old called Christian, who was born prematurely and delivered by emergency caesarean, after doctors discovered that his twin brother had passed away whilst undertaking a routine scan. The awards event brings together BISHTA and SPATA to showcase the best examples of design, construction, installation and innovation in the wet leisure industry. The awards evening is held alongside SPATEX, the UK’s largest Pool, Spa and Wellness Show, an event that sees companies from across the UK and overseas, gather to exhibit their finest products and services, along with promoting themselves and networking with colleagues. SPATEX is not only the UK’s largest, but is also the longest running dedicated swimming pool, spa and wellness exhibition, holding its 20th anniversary annual trade show at the Ricoh Arena, Coventry from 31st January to 2nd February 2016.